Color has the power to envelop a room and the people in it (in a good way!). 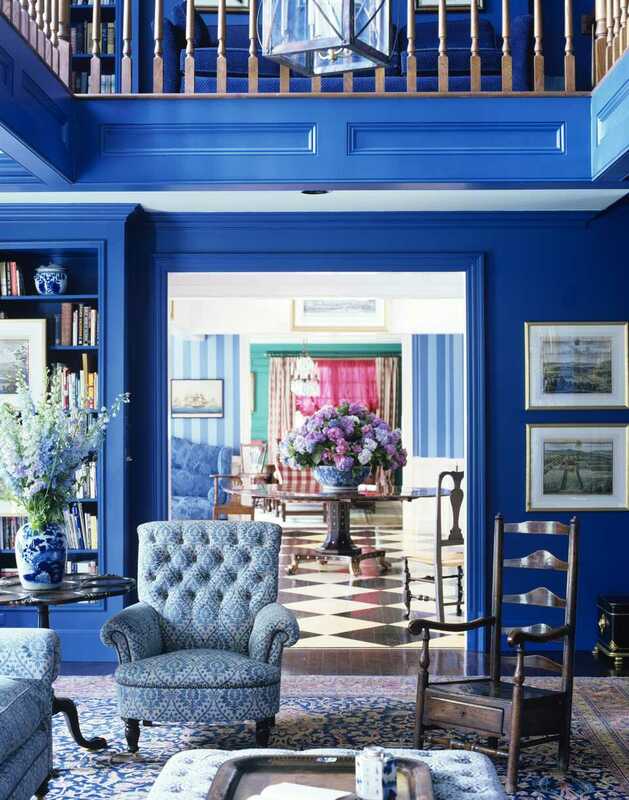 Take this bold blue paint color for example. It doesn't just fill the wall with color, it engulfs the entire space and gives it an electric jolt. Different shades of blue have different meanings, but this particular shade is often associated with wisdom intelligence, success, and confidence, and there's no doubt that confidence plays a part in choosing a shade this powerful. This kind of dramatic treatment is not for the faint of heart, but for those who crave intense color the effect is irresistible. Sometimes color can create a bridge between styles. In this case of this living room from HGTV's Income Property, a colorful Persian-style rug adds a little traditional flair to an otherwise modern (or transitional) room. The warm shade of rusty red plays against the deep brown of the sofa and helps to make the room more inviting. The red and orange pillows enhance the overall effect. Had the rug been neutral it would not have had the same impact and would not have provided the traditional hit this room needed to feel complete. When pulled into patterns, different shades of the same color can be part of a fun and eclectic mix. In 99% of living rooms you'll find a sofa, coffee table, side tables, and a couple of chairs, but a coloful collection like this takes that predictable formula and turns into into something totally unique. Anytime you're using a lot of patterns full of similar colors remember to contrast it with a different, but complimentary, color. In this case the coffee table base adds just enough contrast to ground all the activity and give it a sense of order. Candy stripes are a sweet treat in this antiques-filled pink living room. Pink can be challenging to decorate with because it's such a traditionally feminine color - it can be difficult to give a pink room a sense of gender neutrality and make it appeal to those with a more masculine sense of style. However when pink is embraced and used to such a degree as it is in this traditonal living room, one can't help but appreciate its sweet appeal. Sometimes more is more, and in this case the overabundance of pink is a delicious delight. Color blocking is a technique that comes and goes on a fairly regular basis, but this bold example makes a strong case for keeping it around. The reason this vignette works so well is the use of the complimentary colors blue and orange. Together they are dynamic and play up each other's intensity, making them pleasing to the eye. They balance each other perfectly. The yellow in the painting acts as an accent while the light blue of the bench adds a little softness. This striking combination creates excitement without confusion and keeps the eye grounded. Strategic hits of color can make a comfortable room feel even more cozy. In this basement family room the lower half of the wall was painted a warm rusty red which envelops the white sofa and chairs and gives the seating area a sense of intimacy. The throw pillows, window treatments and mirror frames all help to enhance the effect. Keep in mind also that painting the bottom half of a wall a rich color and painting the top half a much lighter color can help a ceiling to appear higher. The technique is used to great effect in this room from HGTV's Income Property which is in a basement. Pastel rooms are soothing, welcoming, and just plain pretty. And what's really great is that they're much more adaptable than many people think. Pastels are not just for little girls' rooms - they can be used in any type of room, and for people of any age or gender. So if you're not into bold colors try experimenting with soft pastels. Blue, pink mauve, green, grey - soft versions of pretty much any color can make decorating with color a breeze. The closer you get to white the less intimidating it is! Try to use at least three patterns in a room and vary the scale of all three. One large, one medium, and one small; or one medium and two different smalls for instance. Try to use colors that are the same intensity in the same room. For instance, don’t mix pastels with jewel tones. Different patterns can often work together if they’re of the same hues. Notice that in this room all the colors are of a similar intensity. Distribute patterns evenly throughout the room. If the majority are all on one side of the room the entire space will look unbalanced and off-kilter. Sometimes color can be used as a way to bring back the decor of years gone by. This room looks like it belongs on the set of Mad Men because it practically screams 1960's and 1970s, thanks largely to the classic avocado green upholstery and drapery fabric. The pattern certainly helps, but the color is what really stands out. This look definitely isn't for everyone, but for lovers of retro-vintage-chic, this green goddess is definitely worth envying!